Ecowarm RadiantBoard is designed to provide the perfect mix of performance, efficiency, cost effectiveness and environmental features. But, all radiant heat delivery systems are not equally efficient…far from it. Please read below but also consult our product comparison pages and the accompanying performance charts of different types of systems. There are huge differences in efficiencies that directly impact the building heating costs and comfort levels. 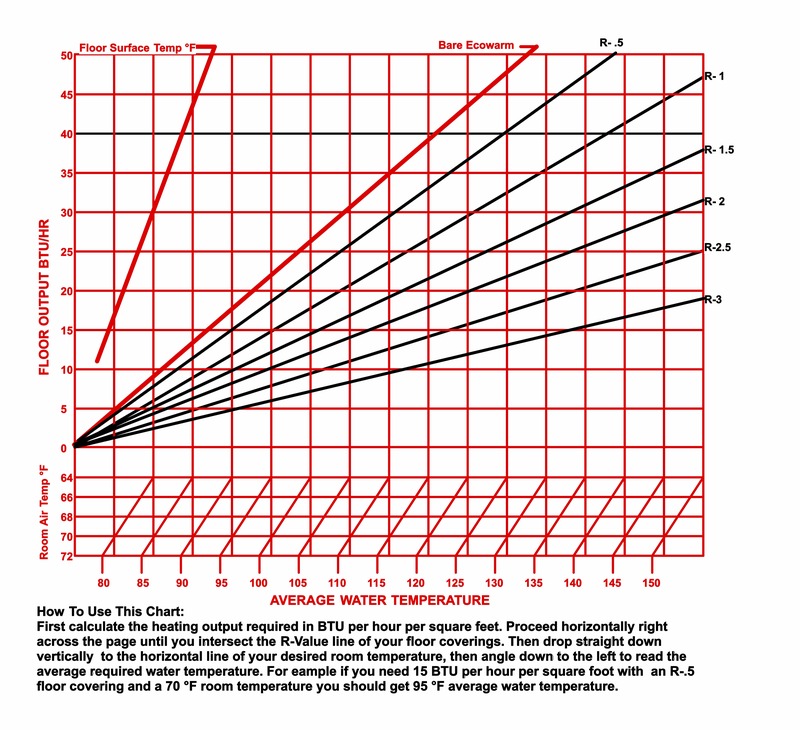 The performance of a radiant floor thermal mass system is generally measured by the temperature of the supply water temperature required to meet the load of a space and the response time to meet the BTU load. Ecowarm RadiantBoard can meet loads with low supply water temperatures and provides very fast acceleration due to its very low mass and the highly conductive aluminum laminate. 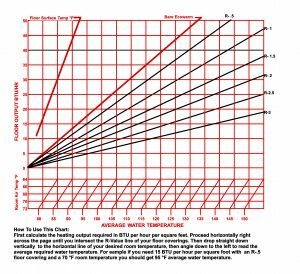 Generally speaking, thermal mass system efficiency is determined by the supply water temperature required to achieve a given BTU load. The lower the temperate of the supply water temperature, the more efficient the radiant system and the lower the operating costs. Our low mass and highly conductive laminate disperse heat rapidly, resulting in low supply water temperatures. For instance, we can use a low supply water temperature of 92F to produce 15 btu per sq ft on a bare floor surface, which is a typical heat load requirement for modern homes. This temperature is well below most other means of delivering radiant heat. Of course, the resistance of various floor coverings will affect supply water temperature and must be factored in the design of all systems. This means with Ecowarm RadiantBoard, you start with a very efficient delivery system resulting in lower water temperatures when the floor covering resistance is added on top of Ecowarm RadiantBoard. Ecowarm RadiantBoard is capable of providing the BTU heat requirements of virtually all modern homes. It should be installed with good hydronic practice, designed with an understanding and consideration for the R-value of the floor coverings and required heat loss of the structure. Download and read our Installation and Design Manual for more information regarding the design and proper installation. This Ecowarm RadiantBoard Performance Chart above is more sophisticated than the one in the Installation Manual and may be downloaded here. 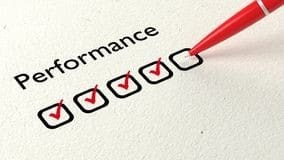 Other important measurements of performance are how fast the product heats up and how the temperature spread across the panel. Ecowarm RadiantBoard accelerates rapidly, six times faster than concrete and therefore is suitable for use with setback thermostats. At the BTU outputs of most houses that meet new energy codes, Ecowarm operates with little temperature banding. The pictures below show an Ecowarm RadiantBoard heating system operating at 15 BTUs an hour output with less than 2.8 degrees of temperature difference across the board. You are looking at Ecowarm RadiantBoard covered by 3/4″ of oak flooring. the crosshairs indicate the high (81.1°F) and low (78.3°F) temperature across the board and 3 sensors are shown that verified the thermographic camera readings. Ecowarm RadiantBoard is available with sustainably forested FSC® certified Plywood made here in America and uses aluminum with recycled content also made in America and our aluminum layer is bonded with a low impact No VOC water-based adhesive also American made. Our goal is to make the most environmentally responsible, cost-effective high performing radiant board in the business.